New eKYC EPFO portal is live. Now you can link Aadhaar Card with UAN without login to the site. You just need to provide your UAN, Aadhaar Number and Mobile number for linking your UAN with Aadhaar. Apart from linking Aadhaar, you can also track the status of your EKYC using the new website. Earlier we have already seen How to link Aadhaar to EPF Online on UAN Portal? Today we will see how to use new eKYC EPFO portal for Linking Aadhaar with UAN. Why to Link Aadhaar Card with UAN? It is mandatory to link Aadhaar with UAN for online claim submission. If your UAN is linked with Aadhaar it becomes easy to merge multiple UAN numbers to single. Linking Aadhaar will reduce the requirement of uploading multiple documents as Aadhaar can act as Proof of Identity and Proof of Address. Claim settlement will be faster if your Aadhaar is linked with UAN. How to link Aadhaar with UAN using new eKYC Portal? Steps for linking Aadhaar with UAN using new eKYC EPFO portal are given below. Under Online Services section you will find the link to eKYC Portal. On clicking eKYC portal you will be taken to new eKYC portal. This portal contains two sections. The first section is for EPFO field officer and second for EPFO Member. In EPFO member section you need to click on “LINK UAN AADHAAR”. You will be redirected to a new page where you need to provide your UAN and Mobile Number. After providing this detail click on “Generate OTP” button. OTP will be generated and sent to your UAN linked mobile number. You need to enter OTP and your Aadhaar Number. After Entering Aadhaar Number click on Submit button. On successful Validation, your Aadhaar will be linked to UAN. Note – You may face issue while updating your Aadhaar. The reason could be a mismatch between your credential provided to the UIDAI and EPFO. Mainly change of name or date of birth etc. In this case you need to update your Aadhaar Information by visiting Aadhaar update portal. How to Track EKYC status? In case you have submitted your KYC earlier and you want to know the status follow the process given below. Visit eKYC portal. Under EPFO Member section you will find “TRACK EKYC” link. On clicking this link you will be taken to another page asking for UAN number for tracking EKYC. Provide your UAN Number and click on TRACK EKYC button. The system will provide information about your KYC status. If your Aadhaar is linked earlier and the system finds some mismatch it will also display warning/update information. Note – This is additional facility provided for linking Aadhaar with UAN. The earlier facility of login into Unified portal and updating KYC information will continue. As per me, this wonderful facility of linking Aadhaar with UAN. I hope the information given here will help in linking Aadhaar with UAN. 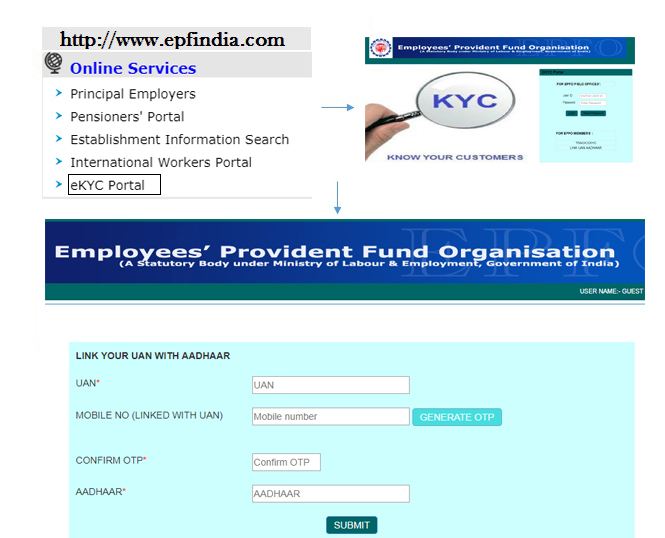 How to link Aadhaar to EPF Online on UAN Portal? You need to update your aadhaar and do re verification for linking/updating. Im facing the same issue cant see any updates on the portal. I have linked my aadhar number with UAN and it is showing successful. But when i tracking the status it is showing validation is successful and details will be updated on 13.11.2017. Today (13-11-2017) again it is showing details will be updated on 14.10.2017,. like viz date is extending but details not updated. The process of verification takes time.Kindly wait for one week and check again. my DOB is incorrect i was requested to correct maximum time but till not solved so plz a likn to update my details in online . Kindly contact your employer.They can help you to update the same. I have linked my aadhar number with UAN and it is showing successful. But when i tracking UAn it is showing validation is successful and details will be updated on 20.10.2017. I have again checked on 20.10.2017 again it is showing details will be updated on 21.10.2017,. like viz date is extending but details not updated. How can i Update it. Thanks for your useful info.